Good Thursday morning! Here in Georgia it actually feels like fall finally. The temp here is in the high 50’s, so that’s a refreshing way to start the day. Since it’s Thursday, let’s go back a ways and reacquaint you with one of my first books, Tender Flames. This book was one of the easiest to write out of the 25 I’ve published. It will take you on a journey of love that will leave you wanting more. They walked hand in hand back to the party, both deep in thought. She was thinking about how her family would react, but mostly how Wes would. Zach knew his family would be happy, well almost his whole family. He knew it was mean of him to want to hurt his brother, but his brother was a fool for not snatching her up long ago. They arrived back at the party. Randy ran over, “Hey sis, everyone wondered where you two had wondered off to. Judging by the look on your face I know what you were doing.” He grinned as he pulled his sister’s hair. She blushed. Zach led her to the front of the dance floor. He whistled for the music to stop. Everyone turned to see what Zach had to say. “I have some wonderful news. I have asked Sara to be my wife, and she has accepted. We are to be wed before my leave is up.” There was a stunned silence then everyone whooped and yelled. There were a lot of handshakes and pats on the back for Zach and hugs for Sara. Her parents were stunned at first, then relieved. They had always hoped she would marry one of the Dawson boys. The same went for his parents, they were thrilled. His mother had even cried. Wes walked up and leaned over Sara. He whispered in her ear. “I hope you know what you are doing?” He then gave her a hug that was tight enough to press the air from her lungs. The look he gave her was full of something she did not recognize. She knew then that he cared more for her than she realized. She was suddenly angry with him. It served him right. He should have let her know a long time ago. She did not plan on waiting on him the rest of her life. He gave his brother a hug and said in his ear. “Brother, she had better not be pregnant. You had better make her happy.” He gave him a look that dared him to go against what he said. With that, he had left with his girlfriend. Categories: Author, Books, COwboys, Heart, Horses, Love, Uncategorized | Tags: #amreading, #amwriting, #throwbackthursday, Love, love triangle, Romance, Writing | Permalink. I’m throwing it back to 2012 with this book that took us on a journey of romance, suspense and that good feeling of HEA. This book was very draining on me as it took such a toll on my senses. This story starts out just as any romance novel, girl knows boy, boy realizes he cares, yada…yada…yada, but then… well, you have to read it to find out what changes the situation. Categories: Uncategorized | Tags: Author, love triangle, Romance, Throwback Thursday, Writing | Permalink. Let’s do a little Throwback Thursday! Let’s go back to May 2012! 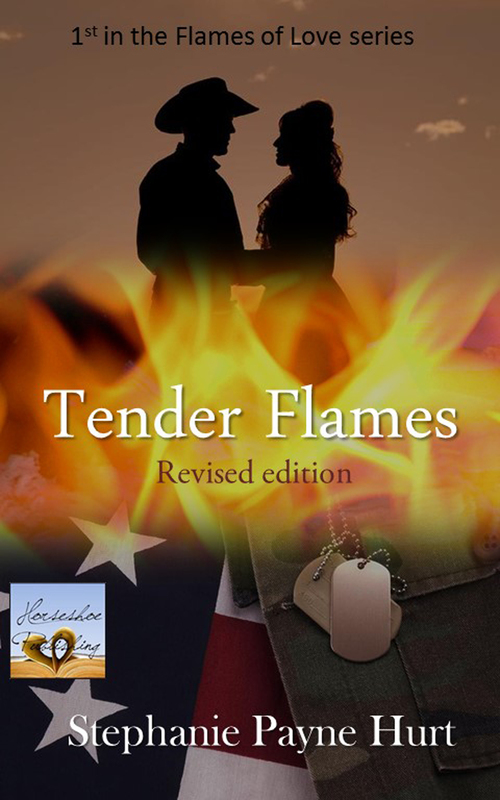 I published Tender Flames, a sweet romance. It actually met with reader approval and some disapproval. As I’ve done with some of my earlier publishings I’ve revised this book and made it better. My writing has changed drastically from the early days. With that said, let me give you a look at the new cover. If you’ve read Tender Flames, then you totally get this cover, if not, then I hope you’ll grab a copy. This romance is a love triangle that pulls you in and takes you on a ride. I love this story for the unique quality of the romance that has grown from childhood for the main characters and yes I mean the three in the triangle. That’s what makes it special. P.S. Still waiting on the results for the Harlequin SYTYCW15 contest. Keep those fingers crossed. Categories: Uncategorized | Tags: #amwriting, #SYTYCW15, Amazon, Authors, avonromance.com, Childhood Love, love triangle, Stephanie Hurt, Tender Flames, Throwback Thursday | Permalink. “A Love Never Lost” Oh the turns it’s made! “A Love Never Lost” Oh the turns it’s made!. Categories: Author, Books, COwboys, Experiences, Life, Published Books, Reading, Romance, Uncategorized, Writing | Tags: contemporary romance, Cowboys, fiction, Love, love triangle, Published Books, Romance, Writing | Permalink.